Accounting for exchange rates within Sage Financials (formerly Sage Live) can be a pain, particularly for multinational corporations. Not to worry though, FX ratefinder is to the rescue! Its practicalities are massive, giving you the ability to search different rates to scheduling regular automatic jobs with those rates. 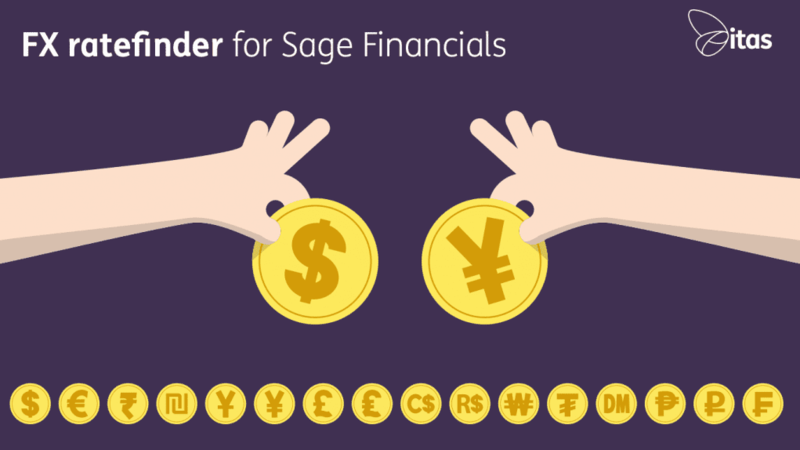 What is FX ratefinder for Sage Financials? 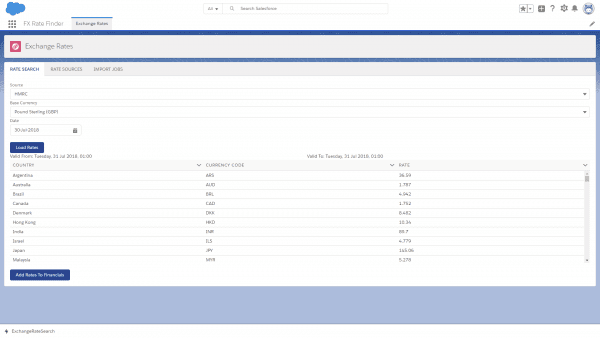 FX ratefinder is a Salesforce business app for automating the process of entering exchange rates into Sage Financials. It provides a selection of reputable foreign exchange sources to choose from giving access to daily current and historical rates. You can search from sources such as HMRC and XE.com. 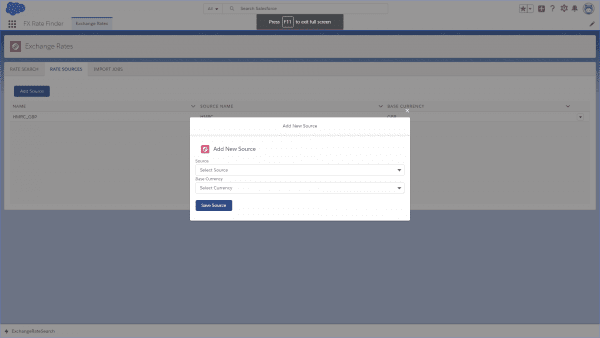 Following that, you can import your chosen rates into Sage Financials from Rate Search, a process we will review later on in this blog. FX ratefinder’s key feature is the ability to schedule regular import jobs that will automatically import the latest rates for your chosen sources when you want them. This is especially useful for weekly, monthly or annually repeated operations, as this flexible app can accommodate for any and all of these requirements. Additionally, FX ratefinder can provide support for up to 8 base currencies and up-to 160+ Quote currencies (depending on the source). For the value that FX ratefinder provides, its financial costs are minuscule. If you wish to pay a monthly price for the app, there is a £99 upfront set up cost with an additional £69.99 a month maintenance cost. However, if you wish to pay annually, there is a £99 upfront set up cost with a £720 a year maintenance cost. This comes to a £60.99 monthly cost, resulting in an annual saving of £108! If you wish to enquire about FX ratefinder, please follow this link and click the ‘find out more’ button. Enter the required details, and we will get in touch as soon as possible. It’s as easy as that! As with any other app used on Salesforce, FX ratefinder can be easy to learn, yet hard to master. Hence, we are going to give a brief run-through of how to make the most of this intuitive application. We are going import sources into Sage Financials, from those sources search for rates from our chosen source, and then finally create a job from those rates. This may seem daunting at face value, but with FX ratefinder’s friendly user-interface, there is no need to fret! As can be seen in the screenshot above, enter the source and company details from their respective drop down menus. Then click ‘Save Source’, and you should see your new rate source on the ‘Rate Sources’ page. You have now added a source, and are one-third of the way to creating a job using your chosen rates! Now, we will now review how to search through rates from your new source. As can be seen in the above example, I have entered HMRC, Pound Sterling (GBP) and 30th July 2018 for the Source, Base Currency and Date respectively. FX ratefinder has then provided the exchange rates for countries such as Argentina to Malaysia as of the requested criteria previously stated. You are now two-thirds of the way to creating a new job, with your rates and sources now decided. Finally, we need to create the job! The required fields (the fields with the red star next to them) must be filled in. Therefore, enter the job name you want and the source of the exchange rate (what we found in step 1). Now, this is where you get a chance to customize what type of job you want to perform. 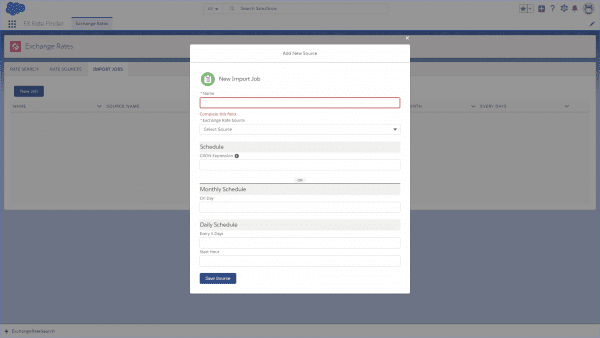 You can either schedule the job via the CRON Expression or the monthly and daily schedule option. The monthly and daily option is pretty self-explanatory, where you can choose how often the job should be undertaken each month or every X number of days. However, the CRON expression may be alien to you. Don’t worry though, you can use Cron Maker to create CRON expressions. This easy program allows you to identify the schedule you want to create and generates the appropriate CRON expression. You can then copy and paste this expression into the CRON expression field in FX ratefinder. Once you have done one of these two options, click ‘Save Source’ and you are finished creating your job. Congratulations, you have imported a source, found rates from that source and created a job from those rates! If you are still struggling to get the hand of FX ratefinder for Sage Financials (Sage Live), please don’t hesitate to contact us. Our friendly team would be happy to help with any queries you have!